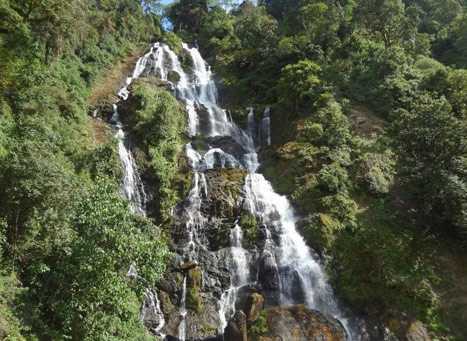 Being the biggest waterfall in Ukhrul, The Khayang Waterfalls is also popularly known as the Telly Waterfalls but the locals prefer it calling Khayang. Visiting the attraction, tourists can witness how the waterfall which is at a height of approx 745 ft. appears to be magical to the eyes, mind and soul that slowly cascades down the hills. For the nature lovers, a visit to Khayang is a must as it helps one feel rejuvenated. Also, the place is blessed with thick deciduous vegetation and displays a wide variety of flora and fauna which is truly mesmerising. The Khayang Waterfall is a good place for the ones seeking some adventure activity. In the sense, one can get indulged in trekking up to the picturesque waterfalls crossing the lush green forest and scintillating rivers. The scenic beauty that appears while going to the waterfall is a fest to the eyes which is indescribable and can only be felt by being there. In short, a visit to the Khayang Waterfalls is worth a visit especially to the ones who want to lose themselves amid nature and for those who want to experience the thrill. Other than this, the tourist attraction in Ukhrul makes a perfect picnic spot. One can avail public transport facility to get to the Khayang Waterfalls and experience the captivating beauty of nature. Consider visiting during the monsoon season between July and September and winter season between November and February when the weather remains pleasant to make the most out of your visit to the Khayang Waterfall. The Khayang Waterfall can be visited at any time of the day. There is no entry fees to Khayang Waterfall.